As part of a two week festival 'Triptych: The music of Eliane Radigue, presented by Sound and Music, London', June 2011, Sonic Bed_Scotland was installed at Rich Mix playing Omnht (1970), one of Radigue's early tape and feedback works. Mixed by Matthews in the Bed using Philip White's software instrument, the clarity of space and landscapes created from stereo are extraordinary; undulating bass vibrations underneath, varieties of horizontal and vertical highs occasionally corkscrewing over elliptical. Sonic Bed_Scotland is the fifth in the music for bodies worldwide Bed series, is a localized version of Sonic Bed_London, and was commissioned by Le Weekend Festival supported by PRSF foundation, launched on May 25th 2007 at the Tolbooth Scotland. Ever felt music through your back? Or slide up and down your legs as it spins round your arms to your fingertips? A Sonic Bed will let you do just that. Stand near one and you'll hear it, go lie in it and you'll feel it make another sense, transformed into an immersive and intimate experience. How do we perceive music ? How does the context in which we experience it affect our understanding ? Is musical atmosphere a function of time ? Can we stimulate our nervous systems directly with its frequencies so adjusting our experience of the environment void of linearity? How can we listen ? 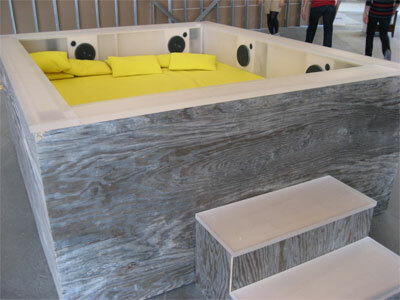 Sonic Bed is an instrument to lie in and feel music. The music moves under, over and around your body in ever-changing paths of vibration. Here it plays Bend, an original work Kaffe Matthews composed for the sonic bed using the sounds of her theremin, which she played and processed while lying in the Bed, also moving the theremin around the Bed, as well as Éliane Radigue’s composition Omnht. Bend can be heard when you stand next to the bed. But visitors who lie down in the instrument will feel it make another sense, becoming an immersive and intimate experience. 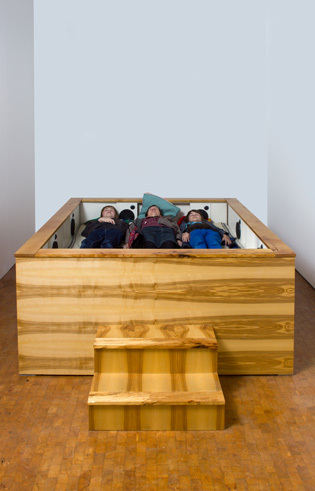 Sonic Bed is an acoustic and social experiment that explores our perception of sound. It was developed as part of the ongoing research project music for bodies.